Doyou run the team tea club? Stay awake longer with this coffee! Trouble Staying Awake on Shift? I do like Coffee and I would often start my shift with a coffee, the same as most cops. So it’s no suprise that someone has come up with a blend that suits Police Officers, friends and family. 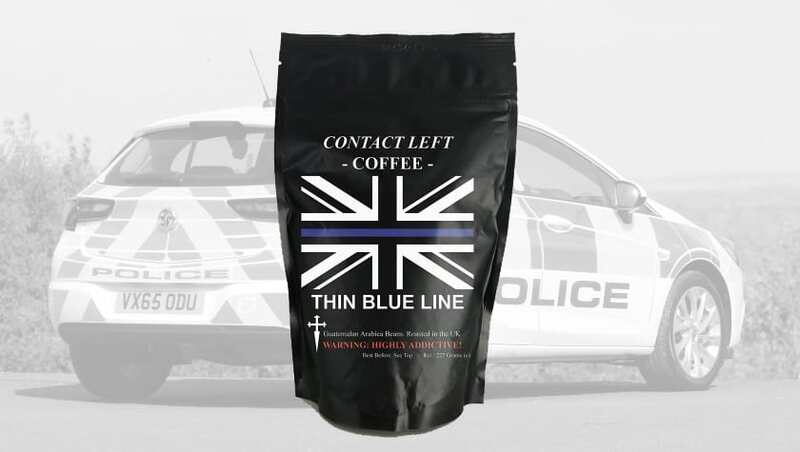 So have you seen the latest edition to the Thin Blue line range? You can now get this Coffee pack to keep you awake and alert for your shifts, or if you have a full day with the kids! Lots of people drink coffee these days and it is a very popular feature on the high street and shopping centres. This Thin Blue line blend is apparently grown high up in the El Trifino Mountains. This area is known as the Farm in the clouds and due to the mild temperatures throughout the year, it allows the coffee time to properly mature and grow. This area of Guatemalan is home to rich dense soil and due to the climate provides the ideal environment to grow some of the worlds tastiest caffeine. Well the packaging states this particular coffee has a rich body with a honey sweetness and caramel finish. I have ordered some myself and will let you know my thoughts once I have actually tasted it! So why not give it a try, you might even like it. I am sure the hardned coffee drinkers amoung you will be dying to get your hands on this new blend. A warning to you lovers of coffee is that the packaging says “Highly Addictive”, So don’t drink too much! On the plus side a percentage of all sales will be given to the police in coffee or to police charities. This is a great idea and I hope the company keep their promise.